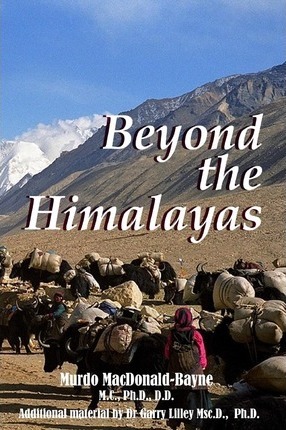 Beyond the Himalayas is a personal account of the awakening spirituality within the author through his soul-changing encounters with spiritual Masters in Tibet and throughout the Himalayas. This story creates a rich tapestry against the background of the mighty Himalayas at a time when Tibet was a free country prior to the Chinese invasion in 1950 and the subsequent destruction of more than 6,000 monasteries and learning centres. This pilgrimage led to the author's rich and fulfilled life as healer, author and lecturer which has inspired thousands all over the world to this day. Mentored by many great lamas in monasteries throughout Tibet and the Himalayas, Dr MacDonald-Bayne gives the reader a pristine view of an uncluttered spirituality unaffected by dogma and formality. Written towards the end of the author's life it remains a classic in metaphysical writing, a quality shared by its equally famous sequel, The Yoga of the Christ. Celebrated author and lecturer, Dr Murdo MacDonald-Bayne or 'Dr Mac' as he became affectionately known to his students around the world, is recognised today as one of the most important holistic healers, philosophers and metaphysicians of the twentieth century. Dr MacDonald-Bayne, the second son of a farming family, was born in 1887 at Kenmore in the Highlands of Scotland. From a very early age he was aware of a spirituality that, while not understanding its full significance at the time, was to lead him into an extraordinary life that gained him recognition as a world leader in holistic healing and metaphysics. After studying to become a medical doctor he went on to achieve Doctorates in Divinity and Philosophy. Dr MacDonald-Bayne served with distinction in the Great War and earned his first commission as Second Lieutenant in 1917, later being promoted to Lieutenant in 1919. He was awarded the British War Medal, the Victory Medal and the Military Cross after being badly wounded in France. He lived for some time with his family in New Zealand and later in Australia. Travelling constantly and visiting some 23 countries lecturing and healing in the years that followed, 'Dr Mac' eventually established a healing centre in South Africa where he settled for some time and where his renowned lectures were given. Eventually he was led to India and Tibet where he received higher spiritual tuition from Masters in lamaseries and monasteries throughout the Himalayas. This experience had a profound effect on the work that followed. During the course of his career Dr Murdo MacDonald-Bayne established centres in Canada and the United States and further expanded his work in Australia and New Zealand. He passed away suddenly during a family visit to the United Kingdom in 1955. Dr Murdo MacDonald-Bayne has left a great legacy through his writings and recorded lectures which are recognised worldwide as classics in the science of metaphysics and spiritual thought.